Cat5 VGA Long Range Receiver work with VADU01T and VADU04T Series 1x RJ45 input / 2xVGA and Audio Output. 12VDC Power. Transmission Distance up to 1000ft / 300m. VGA video and audio signal transmission via UTP cable (CAT5 / CAT5e). Built-in brightness and contrast adjustors. 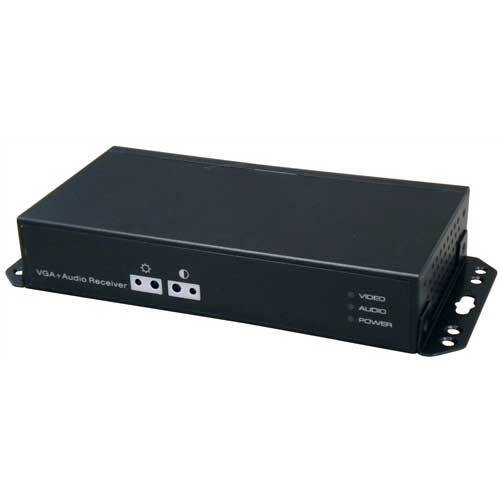 Provides two sets of VGA video and audio outputs. Quality stereo audio High video resolution depends on the length and quality of UTP cable with standard resolution 1024x768 and up to 1600x1200 @ 60Hz. Exceptional interference rejection. Built-in transient protection. Multi-platform support; supports PC. Mac. Sun. and Linux systems. Supports VGA. SVGA. XGA. SXGA. and Multi-sync monitors. OS Support: Windows 2000 / XP / Linux / Mac / Sun. 12V DC Power. VGA Balun 1 in 2 out Transmitter work with VADU122R Transmit VGA and Audio Signal up to 1000ft at 1024*768 VGA and Audio input/ One VGA and RJ45 output USB power. Transmission Distance up to 1000ft / 300m when used with VGAE1R. VGA video and audio signal transmission via UTP cable (CAT5 / CAT5e). 350 MHz signal transmission bandwidth. Provides one RJ45 output and one pair of local VGA video and audio outputs. Quality stereo audio. High video resolution depends on the length and quality of UTP cable with standard resolution 1024x768 and up to 1600x1200 @ 60Hz. Exceptional interference rejection. Built-in transient protection. Multi-platform support; supports PC. Mac. Sun. and Linux systems. VGA video and audio signal transmission via UTP cable (CAT5 / CAT5e). 350 MHz signal transmission bandwidth. Provides four ports RJ45 outputs for transmission and one pair of local VGA video and audio outputs. Quality stereo audio High video resolution depends on the length and quality of UTP cable with standard resolution 1024x768 and up to 1600x1200 @ 60Hz. Exceptional interference rejection. 8-Way VGA Splitter 450MHz Max 2048x1536 Resolution. Takes PC video signal and displays it on 8 VGA monitors. This product is a signal booster and duplicator which can take video input from a single source; broadcast and display it on four VGA monitors in a distance up to 180 feet (60M). It features a signal bandwidth of 450MHz. High resolution setting of 2048 x 1536 in 24 or 32-bit true color mode will also secure the high quality of the video graphic images to be displaying. It's ideal for an environment of education; meeting and commercial demonstration. Baluns are employed to convert unbalanced signals to balanced one or on the contrary. You can get various PC Baluns at SF Cable and get them delivered at your doorsteps. Our wide range of products include long range VGA and speaker receivers, long range VGA and speaker 1 in 2 out transmitter, long range VGA and speaker 1 in 4 out transmitter, Long Range VGA, PS2 Keyboard & Mouse Split Extender, and many other products.